The 2019 All-Paid Team is a collection of the highest-paid players in the NFL at each position. It’s essentially an All-Pro team, but the pocketbook supersedes pedigree and production for the day. Average annual value (AAV) is the most accepted measure of comparison for player contracts, so it’s what will be used for our purposes. Also, players who received the franchise tag are ineligible, due to the fixed nature of their salaries. If you need help understanding any of the terms in this article, please refer to our Free Agency and Contract Glossary. NOTES: All contract information is from Over The Cap and/or Spotrac.com. Cap percentages are based on the league-wide cap of $188.2 million. Also, stats since signing are listed EXCEPT for players who signed in 2019, or for offensive linemen or the long snapper. The highest-rated passer in NFL history (103.1 career passer rating) is also, fittingly, the highest-paid player in NFL history … for now. Seahawks star Russell Wilson is entering the final season of his current contract, meaning the baton for QB contracts should be passed along soon. Rodgers received $66.9 million in the first year of an extension that included the largest signing bonus in NFL history ($57.5 million). It was a surprise that Le’Veon Bell did not end up resetting every current running back paradigm this offseason, especially because Gurley negotiated his extension with two seasons left on his rookie contract, while Bell was an unrestricted free agent. Gurley’s deal still paces the market in terms of AAV, with Bell’s Jets deal averaging out to $13.1 million, but Bell did receive more full guarantees ($27.0M) in his New York contract. A knee injury hindered Gurley’s playoff run (four carries for 10 yards and one TD in the NFC title game) and Super Bowl performance (10 carries for 35 yards), but he’s been the most productive running back in the NFL since 2015, leading the league in scrimmage yards (6,430) and touchdowns (56) over that span. Stats since signing: 14 games, 256 carries, 1,251 rush yds, 17 rush TDs, 59 catches, 580 rec yds, 4 rec TDs. The Giants signed Beckham to an extension in 2018, paid him $21.5 million for last season, then traded him to the Browns. In Cleveland, the value the LSU product brings to both the franchise and the city transcends the football field. That said, his impact on the field can’t be understated: The five-year veteran has three seasons with 1,300-plus receiving yards and 10-plus receiving TDs, which is three more than the Browns have had from any player in their 70 seasons as a franchise. The Giants carry the $16 million in dead money remaining from Beckham’s signing bonus, so the Browns have him under contract for an average of $15.4 million over five seasons, although Beckham may already want adjustments made to his contract. The details have yet to be revealed, but we do know AB got a new contract with his new Raiders jersey. After acquiring him from Pittsburgh via trade, Oakland replaced the three years and $38.9 million he had remaining with $50.1 million over the same span. The team also guaranteed $30.1 million; Brown had no remaining guarantees with the Steelers. If compared from the time of signing, Brown has a higher AAV ($16.7M) than Beckham ($16.4M), because the latter had one season remaining from his rookie deal on top of his five-year extension. NOTE: To be considered a slot receiver, a player must have run at least 50 percent of his routes in the slot in 2018 (with a minimum of 200 routes run). Landry, who has the most receptions in a player’s first five seasons (481) in NFL history, will be securing the bag with his former LSU teammate Odell Beckham in Cleveland. The Dolphins placed the franchise tag on Landry after the 2017 season before trading him to the Browns, with whom he signed his new contract. The team can easily get out of the deal after the 2019 season, with the amount of dead money dropping to $4.5 million in 2020. Stats since signing: 16 games, 81 catches, 976 rec yards, 12.0 ypc, 4 rec TDs. Graham struggled to establish chemistry with Aaron Rodgers in his first season with the Packers, tying a career low with 2 receiving touchdowns. However, even though he’s far removed from his prime, he’s still the highest-paid tight end in the NFL. Unless he transforms into a ghost of Jimmy Graham‘s past, the Packers will likely part ways with the tight end and save $8 million against the cap in 2020. Starting offensive tackles are hard to come by. On the open market, average-to-good tackles are paid like great ones. This is a what-have-you-done-for-me-lately league, and Brown’s playoff run with the Patriots was as good as any three-game stretch by any tackle in the NFL. Raiders QB Derek Carr should welcome the presence of the 6-foot-8 Brown; according to Pro Football Focus, Brown did not allow a sack in 136 pass-blocking snaps during the playoffs, while Raiders tackles allowed the most sacks (30) in the NFL. In 2017, the Jaguars led the NFL in rushing. The following offseason, they added Norwell. In 2018, Norwell finished as Pro Football Focus’ 60th-ranked run-blocking guard, while the Jaguars finished 19th on the ground. Norwell’s $30 million in guarantees are all in the first two seasons, so another poor season could mean Norwell getting a pay cut or a pink slip next offseason. Morse isn’t mentioned among the elite at the center position, but that’s where his contract ranks. The Bills ranked 30th in total and scoring offense last season. Morse, who was part of a Chiefs offense that ranked in the top five in both scoring and yardage over the last two seasons, will look to help second-year quarterback Josh Allen turn that around, while leading the way for three running backs (Frank Gore, LeSean McCoy and Chris Ivory) who will be a combined 98 years old when the season starts. A knee injury forced Martin to miss two games in 2018, but he went on to be named first-team All-Pro for the third time in his five NFL seasons, while his running back, Ezekiel Elliott, has led the NFL in rushing yards per game in each of the last three seasons. Martin’s $14 million AAV is the highest among all interior offensive linemen. The Cowboys currently allocate more 2019 cap dollars to their offensive line ($57.2 million) than any other team in the NFL. Picked 19th overall by the Dolphins in 2014, James has a first-round pedigree but has yet to find consistency in the NFL. He flashes and disappoints. Like Brown, James may not be the best at his position among his NFL peers — but his direct deposit suggests otherwise. His $17 million cash flow this season is also the most at the position. There’s only one reason Khalil Mack is the NFL’s highest paid defender and Aaron Donald is not: Donald signed first. But it’s not difficult to argue Donald is the NFL’s best player. The Rams enjoyed an $8.9 million cap hit last season and will have another modest $17.1 million charge this season. 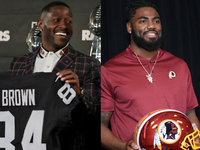 However, the reigning two-time Defensive Player of the Year’s cap numbers rise to $25 million in 2020 and $27.9 million in 2021. Stats since signing: 16 games, 59 tackles, 25 tackles for loss, 41 QB hits, 20.5 sacks, 4 forced fumbles, 2 fumble rec. The two players with the most QB hits last season were Aaron Donald (41) and Cox (34). Cox is one of the NFL’s elite interior defenders, and he’s paid accordingly. The Eagles are in the midst of a 10-day window (March 13-22) to pay Cox a $14.67 million option bonus tied to his 2021 season, which would also offer the team cap relief this season. If the Eagles decide against picking up the 2021 season, Cox’s 2019 base salary would escalate from $830,000 to $15.6 million. One way or another, Cox will earn $15.6 million for his services in 2019. Stats since signing: 46 games, 115 tackles, 26 tackles for loss, 65 QB hits, 22.5 sacks, 3 forced fumbles, 4 fumble rec., 1 TD. The Bears made Mack the highest-paid defensive player in NFL history ($23.5M AAV) after trading two first-round draft picks (and more) for the 2016 Defensive Player of the Year. Only four players (all quarterbacks) received more fully guaranteed money than Mack at the time of their respective signings. His impact on the field has lived up to the commitment — he led the NFL’s No. 1 scoring defense en route to his third All-Pro nod in five seasons. The Bears, much like the Rams and Aaron Donald, are in the final season with Mack carrying a modest cap hit. Stats since signing: 14 games, 47 tackles, 10 tackles for loss, 18 QB hits, 12.5 sacks, 6 forced fumbles, 2 fumble rec., 1 INT. Broncos have club options on Miller in 2020 and 2021, which will surely be picked up, given his superior play. He will continue to have cap charges north of $22 million in each of the next three seasons and carries the largest cap hit ($25.1 million) of all defensive players in 2019. Stats since signing: 48 games, 183 tackles, 44 tackles for loss, 73 QB hits, 38.0 sacks, 9 forced fumbles, 4 fumble rec., 1 INT. Mosley completely changed the landscape of the off-ball linebacker market. Not only did he surpass Luke Kuechly‘s previous annual high ($12.4 million) by $4.6 million, but he also bypassed Kuechly’s previous highwater mark for fully guaranteed money by $16 million. The Jets expect an instant impact from one of only three players with more than 500 tackles and nine picks since 2014 (Kuechly and Telvin Smith). Alexander got $13.5 million a season after missing 10 games with a torn ACL in 2018. However, his new contract is full of Monopoly money. It’s essentially a one-year deal worth $14.5 million. The 49ers could save $10.1 million by releasing Alexander after 2019, and the team used a small signing bonus ($4 million) and a large first-year roster bonus ($8.8 million) to avoid pushing dead money into the future. Barr decided to stay in Minnesota after initially agreeing to terms with the Jets. Like Kwon Alexander, he also received a low ratio of full guarantees, but the structure of his contract is more secure than Alexander’s. Barr’s $13 million signing bonus means Barr will have $10.4 million in dead money in 2020. Of all defenders to be selected in 2014, only Aaron Donald (five) has been selected to more Pro Bowls than Barr (four). After the Panthers rescinded their franchise tag following the 2015 season, Norman signed a contract that still has the most total value, total guarantees, full guarantees and average annual value of any cornerback contract on the market. Since joining the Redskins in 2016, Norman is the only cornerback to record at least two interceptions and two forced fumbles in a season multiple times. Stats since signing: 46 games, 64 tackles, 37 passes defensed, 6 INTs, 7 forced fumbles, 2 fumble rec. Johnson played on two straight franchise tags with the Rams before signing his lucrative pact with the Jets in 2018. After making $3.04 million on his four-year rookie contract, Johnson has made $56.7 million over the last three seasons. In a mediocre 2018 campaign, his first with the Jets, he led the team with four interceptions. Stats since signing: 10 games, 40 tackles, 5 passes defensed, 4 INTs, 1 TD, 1 forced fumbles, 1 fumble rec. At 28 years old and entering a contract season, Ryan is playing for another big payday. Although he registered four sacks in 2018, he hasn’t recorded an interception in two seasons. The Titans can still save $10 million against the cap by releasing Ryan, but the former Patriot seems to be part of Mike Vrabel’s 2019 plans. Justin Coleman‘s new deal with the Lions ($9 million AAV) is second among NFL nickel corners — which included guys who played at least 50 percent of snaps in the slot (min. 100 snaps). Stats since signing: 19 games, 138 tackles, 19 passes defensed, 0 INTs, 1 forced fumbles, 4.0 sacks. Prior to and after the start of the new league year, the Chiefs rostered the highest-paid safety in the NFL, albeit two different players. Kansas City released injury-plagued All-Pro Eric Berry ($13 million AAV) and officially signed Mathieu ($14 million) in the span of a few hours. The Honey Badger bet on himself in 2018 and won, turning a one-year, $7 million prove-it deal with the Texans into a three-year, $42 million contract with the Chiefs. Landon Collins idolized the late Sean Taylor growing up, and Washington owner Dan Snyder gifted Collins Taylor’s autographed jersey … with a contract and expectations to match. His $84 million contract is the largest ever given to a safety. The 25-year-old safety is the only player in the NFL with at least 400 tackles and 30 passes defensed since 2015, and is one of two players to lead his team in tackles in each of the last four seasons (joining Eric Kendricks, Minnesota). NOTE: To qualify as a return specialist, one must log less than 250 offensive or defensive snaps. Patterson carved out a role with the Super Bowl-champion Patriots due to his abilities with the ball in his hands. His limitations as a wide receiver never allowed him to live up to his status with the Vikings as the 29th overall pick in the 2013 NFL Draft, but he can be an electric return man and gadget player who has made two Pro Bowls as a return man. Gano led the NFL in field goal percentage (96.7) in 2017, the season prior to signing his extension. The Saints employ the NFL’s highest-paid punter despite punting the ball a league-low 43 times in 2018 (tied with the Rams). Morestead’s 2019 cap number is $229,808 dollars fewer than the 2019 cap number associated with Patrick Mahomes‘ rookie contract. Stats since signing: 43 punts, 46.4-yard average, 43.2-yard net, 15 inside the 20. If a long snapper’s name is being called for inclusion on the All-Paid Team, it’s usually a bad thing. Here’s one example to the contrary. Let’s list the two-time Pro Bowler’s name one more time, for SEO purposes: Jake McQuaide.